I might take a tiny break from my shawl – yesterday, I had to rip over 3,000 stitches due to an errata in the pattern. 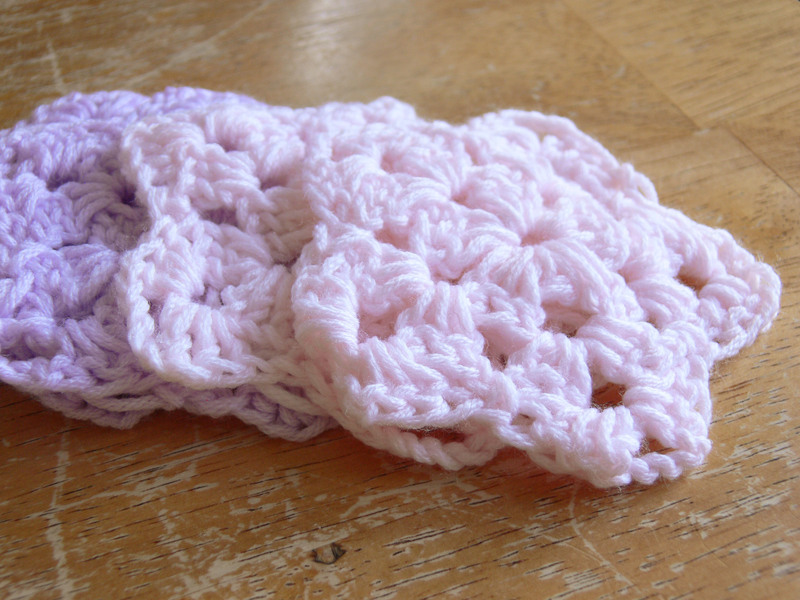 So today, I think I’ll crochet a few stress-free granny squares. I have a lot of this Berroco Comfort acrylic yarn from when I first started knitting, and thought it would make a sweet little baby blanket. The squares are from Lucy over at Attic24 – this is her Summer Garden Square. Her tutorials are really well done – she takes pictures of every step, so that you can visually see what you should be doing! 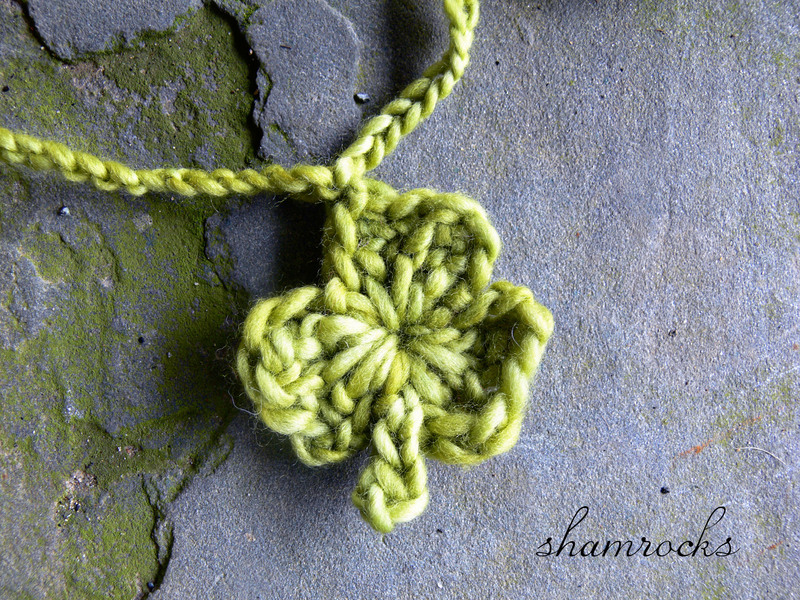 This is perfect for someone just starting out with crochet…like me! Have a great weekend, everyone! Tonight, I will be looking forward to drinking a tall Guinness and getting for the big St. Patrick’s Day party we are having tomorrow night! How about you? How do you celebrate St. Patrick’s Day? 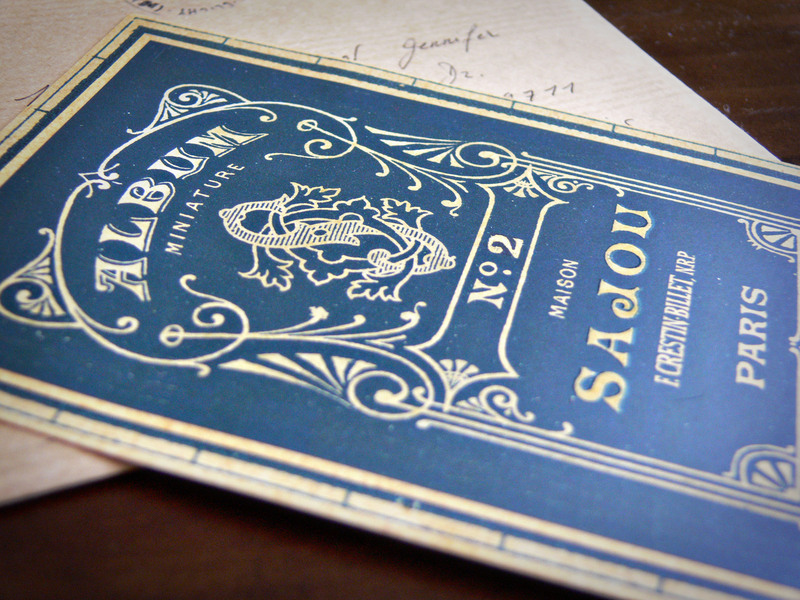 Recently, Dona was kind enough to send me a little mail from Paris. Most people do not send handwritten correspondence anymore, so this was such a nice treat! Inside, there was this postcard, and on the back, a sweet little message thoughtfully written both en français and en anglais. I think I might frame this for the studio! Along with the postcard was: One of her famous petites étoiles! She loves to crochet these little stars, and has over 50, I think. Her stitches are so perfect! She has a special secret for getting it so perfectly blocked, but I will let her share that with you… She also sweetly sent: Petit boutons! 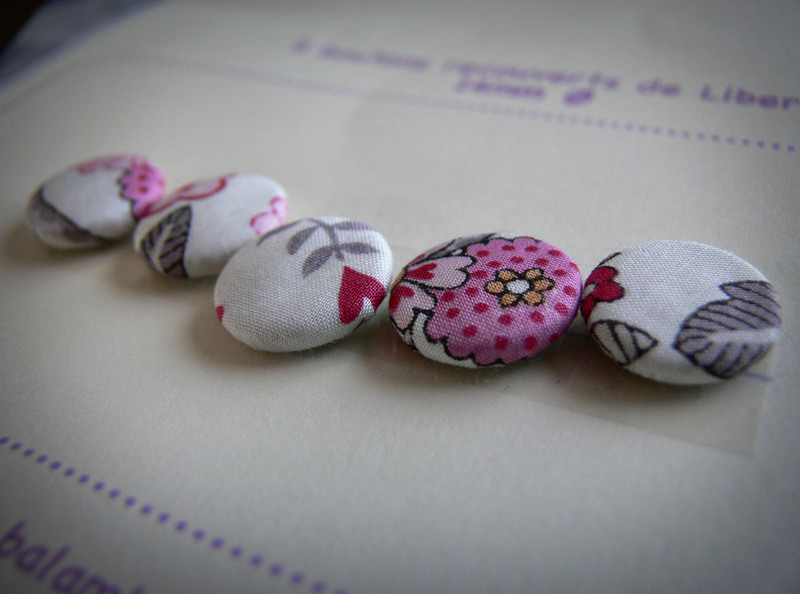 How charming are these little buttons covered in Liberty fabric? 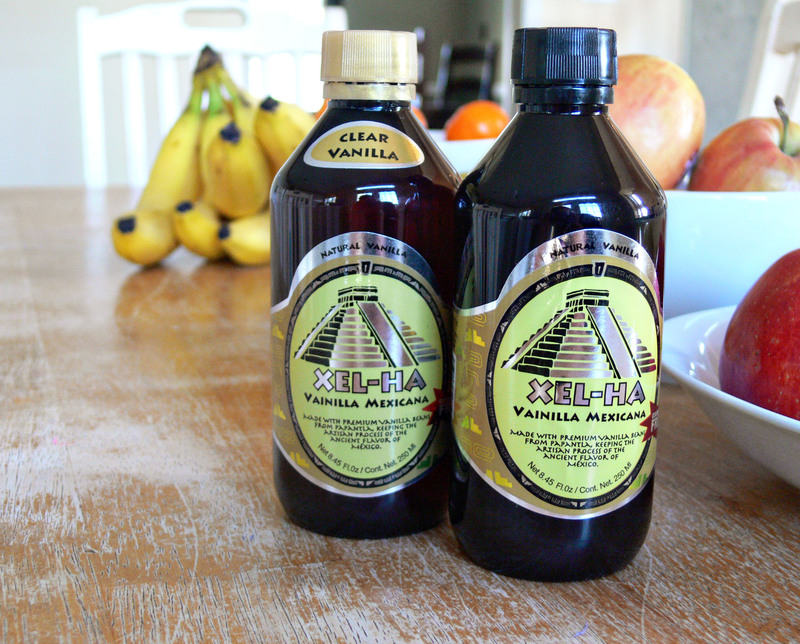 I will have to find un projet spécial for these, for sure. Merci pour ce petit paquet, Dona! Tu es un doux ami. Have a great weekend, everyone! Ravelers: Click here for the pattern page. For my niece’s birthday, I whipped up a sweet little strand of garland for her dressing table, in her favorite shades of lavender, yellow, and white. 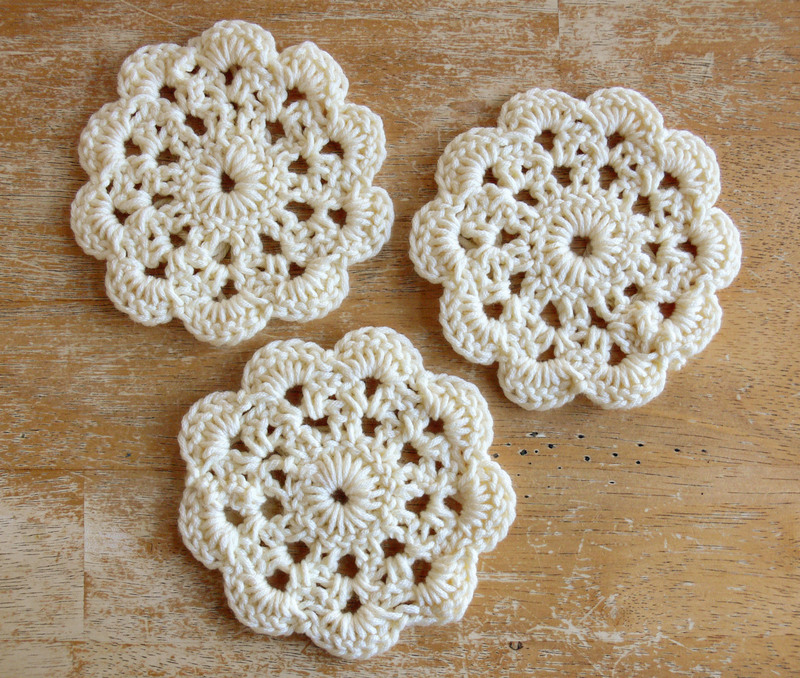 I used a few different crochet patterns from around the web and Ravelry – let’s start with these large Vintage Circle Motifs from 1893: There are three of these, which used up all of my yellow yarn. (Using up stash yarn feels so. good.) 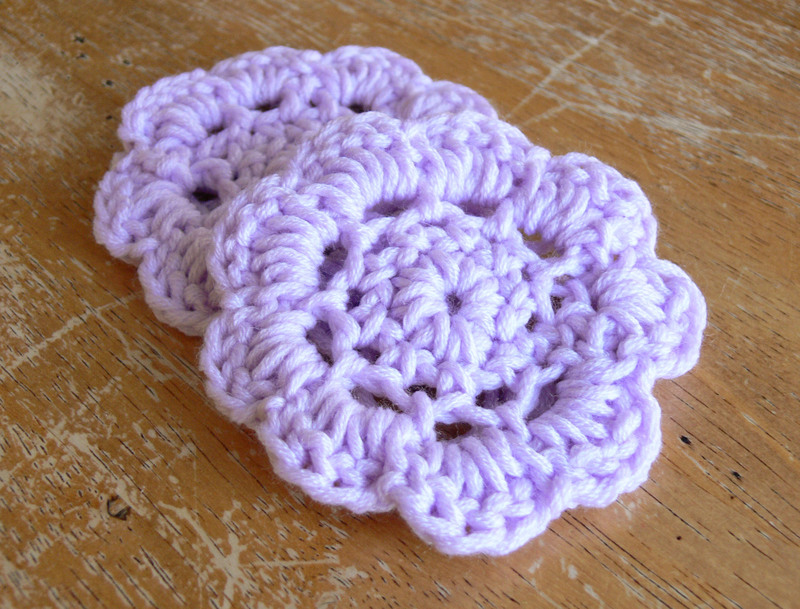 I then took out one of the middle sections of the pattern to make a smaller version – a set of two – this time in purple: While browsing crochet patterns on ravelry, I stumbled across a headband pattern that had this big, bold flower, which I thought sort of looked like a slightly reworked version of the circle motif. I made two in white, to break up the yellow and purple a bit: And of course a couple of tiny stars, from the fabulous Royal Sisters: But my absolute favorite have to be these little baby hearts: I can’t take the cuteness. I am going to knit a whole garland of these in red for Valentine’s Day, for sure. The bigger flowers and circles could probably benefit from a soak in some fabric stiffener, so that they don’t flop over as much. To attach all the pieces together, I did a single crochet on the back right edge of one piece, chained 4, then worked a sc into the left edge of the next piece. I continued this way until all the pieces were attached. Then, on each end of the garland, I chained 25, did a sc to attach the chain to the back edge, then chained 25 more. This way, if she wants to tie the garland to something else, like a curtain rod, she can. Yellow Vintage Circle Motif: Not on Ravelry, found here. White Flowers: Ravelry or Creative Yarn Blog. Grandma Twinkle Stars: Ravelry or The Royal Sisters Blog. Hearts: Ravelry or Simple Beans Blog. All were worked with a size G/4.00mm hook and Berroco Comfort worsted-weight yarn.